With millions of apps in the app stores, App Store Optimization (or ASO for short) is no longer a ‘nice to have’ thingy you might get down to when you have time. Today it’s a blocker. Whatever niche you’re in and no matter what your marketing strategy is, if you have a mobile app, you just have to make sure that it’s well-optimized. Now, there’s plenty of info on this topic, but it’s mostly scattered across dozens of websites and hundreds of blog posts. ASO agencies, with the knowledge and experience they accumulate and complex tools they implement, create comprehensive strategies and processes to best serve their various clients. However, if you’re a small developer who does not have the necessary funds to hire professional ASO services, or if for any reason you decide to opt out, there are several basic factors you absolutely must take into consideration when putting together your app page. So, we at Splitmetrics.com decided it’s time to step in and put together a guide that would contain, if not most of ASO best practices, then at least all of the essential ones. That’s how we ended up with what we humbly named “The World’s Most Ultimatest ASO Checklist“. Affects both your conversion rates and search positions. Is visible in virtually every environment: app page, search results, category charts, related apps, Google search results. Has an effect on your conversion rates in search results, category charts, related apps, on the app page and in Google web search results for certain queries, and can also influence how easy your app is found on the device. Have a drastic impact on your conversion rates (especially the first two screenshots). Visible in search results and on the app page. Just like the screenshots, your video affects your conversion rates on the app page and in search. Is known to both help and hurt your bottom line, therefore A/B testing is highly recommended. While the full description has a moderate impact on your conversion rates, it can influence search on Android. Your short description (the lines before the “read more” link) is also crucial. These are important for search, conversion rates and a good night’s sleep. Search drives over 65% of all app installs in the App Store, so you already know that it’s critical to have an optimal keyword choice. It’s often overlooked, but your website can help your app in Google search (both on the web and in Google Play) and vice versa. Knowing your users is important for a whole bunch of reasons. Knowing your metrics is key to knowing your users. Are you getting enough out of your ASO strategy? 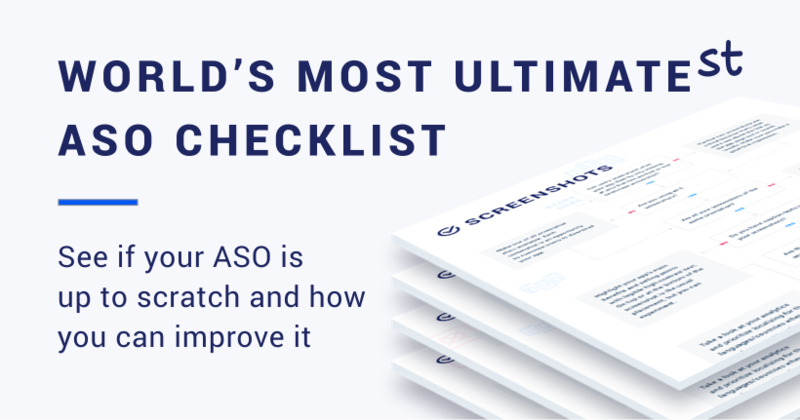 Head over now and grab your free copy of the World’s Most Ultimatest ASO Checklist to find out.